The official Junior Novelisation of The LEGO® MOVIE 2™. Includes full-colour images from the film! 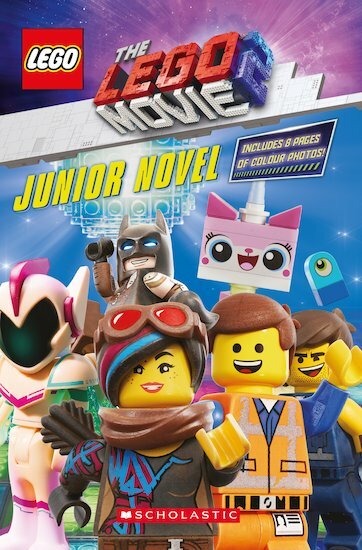 The Junior Novelisation of The LEGO® MOVIE 2™, starring Chris Pratt, Elizabeth Banks, Will Arnett, Alison Brie, and more! Things have changed in Bricksburg since the DUPLO aliens attacked. The city is in ruins. The Justice League™ is missing. Unikitty has become Ultrakatty. Lucy spends her idle time brooding. But among them remains one ever-cheerful, awesome hero — Emmet Brickowski. For Emmet, Bricksburg becoming Apocalypseburg isn’t the worst thing in the world, so long as he has his best buddies by his side and a coffee (with twenty-five sugars) in his hand. But when Emmet’s friends are taken by a mysterious helmeted figure and flown into space, it’s time for this hero to get tough and bring them back… or else. Includes 8 pages of full-colour images from the film.